New for 2015, we are offering an ELECTRIC ASSIST BICYCLE for a new way to see the island. Get your exercise, but have some help along the way. These will be on a limited supply basis, so please call for info about both the Bicycles and the Golf Cart Rentals. 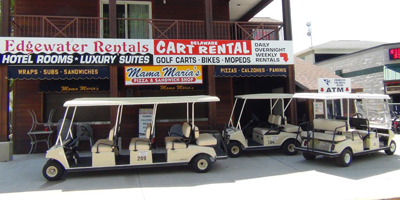 Put-in-Bay Golf Cart Depot is located on Catawba Avenue, just a short walk from the downtown ferry, next to the Reel Bar. Call 419-779-5147 for more information. Delaware Carts’ Golf Carts are licensed as motor vehicles on South Bass Island, and driven on public roadways just as cars do. They are designed in 4-, 6-, and 8-passenger configurations rented hourly, daily or overnight. All carts feature tops, windshields, headlights, turn signals and seat belts and are fully licensed and inspected. Delaware Carts is located on Delaware Avenue, just a short walk from the downtown ferry, between Mr. Ed’s Bar and Lovella’s. Golf Cart Coupon is available.